OGGchat engineering has been busy over the last few months with OGGchat product evolution work and OGGflow integration items. When OGGflow launches the OGGchat service will continue to be available as a stand alone service, or it can be used and bundled with OGGflow workgroup packages. - OGGchat bot now has an idle personality! Normally when you are not engaged in an active chat the OGGchat bot sits quietly on your jabber contact list. If you felt the urge to reach out and say hello - or just to make sure the bot is there ready to send you chats it would not respond. OGGchat engineering decided that this is very cold behavior so we have added support for an offline work mode. Right now you can only type “help” to the chatbot and get the command list. When OGGflow releases, we will be unlocking additional task and customer management features that will add more value to the OGGchat bot friends in your list. When OGGchat bots are driven by the OGGFlow task-flow management and notification system they really take on an artificial intelligence like persona driven by your companies projects, events and people. - A ‘ping’ routine has been added to give your agents / operators a more immediate indication that the site visitor has closed their web browser completely and ended the chat. - Widget security has been enhanced so that users visiting multiple sites that use OGGchat each have a unique identity within the same browser session. - Operators and chat agents can now accept chats more easily by typing the first line of their response to a customer chat request and accept it at the same time without the need to type “yes” to accept it first. - Routing enhancements have been made so that companies with multiple widgets and multiple departments do not get chats routed to the wrong operator skill group when a default department is offline. - OGGchat network bots now automatically re-set their status to online every 15 minutes to compensate for jabber issues which would result in the bots appearing to be offline on some jabber networks. - The OGGchat email services and routing have been upgraded to eliminate issues with chat transcripts not being sent out post chat. BBC: Can Computers Have True Artificial Intelligence? The Guardian : Would artificial intelligence outsmart me? I needn't have worried. - Added support for google live streaming updates. - Added support for facebook live streaming updates. - Updated the threading support in the Gmail connector so that threaded replied in an OGGflow workflow are never removed despite being sorted in the gMail interface. - Added network / device identification for connector replies. This is used to differentiate an internal team member commenting on a workflow vs an user external to OGGflow who has replied via email or social network. - The Facebook social feed management connector was updated with several additional sync options that allow a new OGGflow user group to sync all historic posts, comments and replies from their company pages that occurred before the Facebook connector was set-up within the OGGflow project. Currently Icoa engineering has 152 open enhancement / feature initiatives. Icoa engineering had a full week across all product fronts. The OGGflow team was very busy preparing for the public release. - Many changes and upgrades were made to OGGflow’s speech driven search engine. Items created by OGGflow project teams are broken up into 6 main categories; milestones, tasks, contacts, posts and comments. New search engine visual indicators help OGGflow users to easily sort and identify various data objects within an organizations project flows. - Enhancements were added to universal apps domain connectors. A cornerstone architecture ideology of OGGFlow is to not lock in any of the customer organizations data, and allow the organization to use their own FTPS, or Google Drive, Box, Dropbox content and document sharing suites as desired for storage and business object reference. OGGflow engineering is also working on finishing the Microsoft Office 365 connector so that organizations who have adopted or will migrate to Microsoft’s new business service can use it seamlessly with OGGFlow. - OGGflow engineering collaborated with Icoa marketing in a review and walkthru of the new OGGflow public visitor and information site that will launch at www.oggflow.com later this month. - The OGGflow project contact view received several performance enhancements. The steps required to export OGGflow project contacts to external email clients such as Gmail or Outlook have been simplified and the entire process is now much more intuitive and seamless. - The Evernote project connector is currently being created. The Evernote connector will make it easy for Evernote snippets, pictures, audio notes or other bits of data captured on mobile devices to be instantly shared with the appropriate OGGflow project team and like every other object or event in OGGFlow the Evernote team notes become more valuable when they can become the foundation or a task, milestone, or referenceable team collaboration session. - New image icons have been added to the task priority system. The emergency task status now has an ambulance indicator! The OGGchat development team played a huge role in this weeks task roundup as well. OGGchat as a communications portal plays a very large role in OGGflow for customer support and contact center features. - Chat operator photo feature has been added so that the widget on your website can bear the same charming face as the great people working at your company who are waiting to help site visitors. 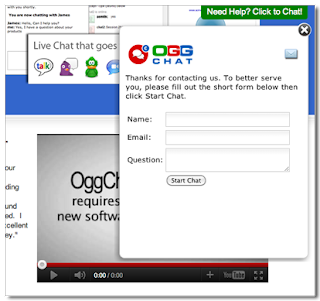 - Many upgrades were made to the OGGchat network database services. International network traffic experiences much reduced latency now for site visitor / operator chats and calls. Currently Icoa engineering has 127 open enhancement / feature initiatives. We will be back with more updates next week! Early this morning OGGflow engineering rolled out V3 of the OGGflow notification system to existing production subscribers. OGGflow notification engine V3 includes an open ended Jabber connector in addition to the standard web, audio and mobile alerts already provided via SMS or the OGGchat network. The standard Jabber interface allows you to get OGGflow project, team and task notifications on more devices using an uncountable number of enterprise and freeware desktop tools, bundled OS chat clients, Google Talk, Facebook Messenger, Adium, Trillian, and iChat among others. Support for the standard Jabber protocol also allows for the OGGFlow developer community to innovate around the new notification interface and do more great things with the notification data and team alerts. Icoa plans to release the OGGflow social flow task management service to the general public around mid March after 2 years of closed environment testing with top customers. In what ways does your organization use Jabber today? The technology thought leadership at Icoa embraced cloud technology for the enterprise over 10 years ago when the OGGsuite software engineering line was first conceived. Icoa answered the markets immediate need for cloud based multimodal communications tools that required no installation and could be seamlessly used by desktop agents in a contact center and mobile agents on traditional phones with no data access and smartphone users alike. Icoa, Inc was an early adopter of Google apps. When the first Google Chromebooks were introduced in June 2011 with full OS functionality designed from the ground up for the cloud, Icoa instantly thought of the hardware and OS footprint as a potential mobile desktop platform for next generation enterprise IT hardware fleet management solutions. Nothing to install and nothing to configure. Business users can log into OGGflow for the first time and just start working and interacting with their customers, partners and internal team members within minutes of turning on a Chromebook. As tasks are accomplished and milestones are achieved the OGGflow business logistics platform populates itself with data and statistics so that as a company idea from a weekend outing turns into a two person team, then a startup, then becomes funded and grows into a small business, grows into a medium sized corporation and then a world dominating enterprise the same OGGflow overlay can be used with nothing else behind it and then in later growth stages a complete array of third party business intelligence, analytics, communications and relationship management tools can be used. All while OGGflow running on thin $250 trouble free notebooks (SAMSUNG Chromebook) remains the familiar overlay employees use on a day to day business to collaborate and succeed. These tools combined let a small group of people take ideas, start a company, stay organized and grow quickly by doing something as simple as ordering a few Chrome OS notebooks from Amazon, turning it on and logging into no install cloud tools and business infrastructure. The low cost entry point of a hardware solution such as Google Chromebook allows for nonprofit entrepreneurial organizations like Virgin Unite to more effectively support global startups and talent with minimal funding and provide reliable enterprise grade business development and communications solutions to drive success. Icoa has completely adopted the Google Chromebook as its own internal fleet hardware platform and over the last 2 years been running completely on cloud based solutions for communications, engineering, hosted infrastructure management, marketing, sales, customer support / service and finance / accounting. Using a combination of tools such as Google Apps, OGGflow, Evernote, Facebook, LinkedIn, Twitter and Amazon EC2 Services Icoa has collaborated with and delivered to customers millions of dollars in professional services and close to 16 billion hours of cloud services for independent professionals and companies of all sizes. The Icoa Engineering and business development staff, having much experience and success with the Chromebook platform are excited to see what new application developments will come from the release of the Google ChromeBook PIXEL hardware platform. We have already received our first round of machines at the office and you can be sure we will release a Chrome optimized OGGflow application with offline syncing database and offline mode to take advantage of the $250 Chromebooks and the new Intel line as well! The Google Chromebook PIXEL has created quite a stir in the press for being a future focused machine. Icoa delivers high availability business solutions for next generation cloud users today. The Chrome OS syncing technology already implemented in Gmail and Google Drive is quite powerful and will drive a seamless offline / online experience on the Chromebooks well. The next generation of cloud based business tools are already here. What are you using? Mobile Enterprise - More Mobility from Google: Chromebook in the Enterprise? Computer Weekly - Can the Chromebook change enterprise desktop IT? ZDnet - Chromebook Pixel: Does this device herald Android and Chrome OS's wedding? NY Times Technology blog - What Is the Point of Google’s Chromebook Pixel? We have had a number of customers ask how we can place the chat widget div over a flash element on their web pages. They've run into issues where part of the embedded live chat widget or the proactive chat box has been hidden behind their flash video. to the "embed" tag of your flash. If you'd like to see a working example, just head over to our home page at http://www.oggchat.com and view the source. You'll see that we've added the parameter to a video on our homepage. Here's how our embedded chat now looks when opened over the flash player. Next, you can change the location of the chat widget to the top or bottom of the web browser. Valid values for the tab_align key are either 'top' or 'bottom'. You can move the tab to the left or the right by using the tab_margin_right value or the tab_margin_left. These values represent the right or left padding in pixels for the tab layer. To change the the colors of the embedded chat tab, you can pick the colors you want with the tab_bg_color and tab_hover_color values. You can use either browser supported colors such as 'red', 'green', or 'blue' or choose a Hex color such as '#999999'. Change the location of the embedded popup chat window by using the popup_margin_right, and popup_margin_top values. These values will shift the chat window from the right margin of the web browser and from the top margin of the browser. You can also use the popup_margin_bottom key to shift the chat widget from the bottom of the browser window.